Helen Rutledge is my cousin. She and I have been sniffing around the same records in the same counties for many years now. I only wish we had met earlier so we could have shared more of the chase. Helen is no “spring chicken” as we say on the farm. In fact, Helen has continued to research far into her golden years – being in her 90s now. Want to hear the great irony? Helen has no children to leave her work to – but this does not deter her. Helen is the aunt that every one of us wants to have in our family. Recently Helen sent me an e-mail that both saddened me and inspired me, and with her permission, I’m sharing it with you. I have omitted some of the more personal portions. After 13 days in the hospital I returned to long term nursing care. I brought my computer and genealogy records from Assisted Living to my new level of care. However, now instead of researching, I am organizing my research to leave for my nephew and some research archives. I have been forewarned in the most urgent way that there may not be time to think about how I will do this when the research is done. Well, we all know research is never finished. Keep urging perseveration of research on your blog. It is as important as the research itself. Answers are no good if I am the only one who knows the answer to the puzzle…I must share it with others whether they give me credit or not. I thank you for alerting me to that truth and God for allowing me extended days to get my records in order as a gift to other researchers. Oh, the many little tidbits I have garnered, documented, and put together for those who follow in my footsteps with our family lineage. Organization is not just entering our data into a genealogy program. It is documenting, making copies of the documents available when possible, and recording the ORDER of our research so those who are not familiar with the records, can follow the generations and become acquainted with their ancestors. Be honest, say information is not documented, when such is the case, and challenge your readers to find documentation. Try to inspire descendants to fill in the blanks and record those who are yet unborn. While they will miss the thrill of solving the puzzle after years of frustration, they will know the joy of learning who they are. Thank you, Helen, for your lovely, inspirational message. Sometimes we aren’t fortunate enough to receive a warning. 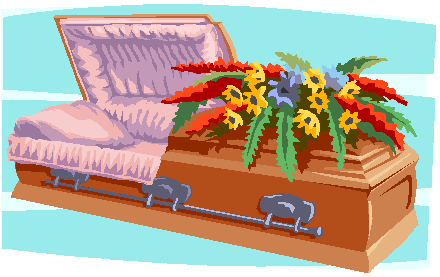 Another e-mail this week told of another cousin’s husband who died suddenly, with no warning, and he was 30 years younger than Helen. I would add one thing though, and that is to record your user names and passwords – especially relative to DNA accounts and tests and anyplace, like GedMatch, you have uploaded your results. Your DNA can never, and I repeat, NEVER, be replaced, while genealogy research could be with enough effort. Don’t let your DNA results become inaccessible. At Family Tree DNA, you can designate a beneficiary. Then select Beneficiary Information and complete the form which includes your beneficiary’s name, e-mail and phone number. If you should pass away, this is who Family Tree DNA will allow to access your account. Other companies, to the best of my knowledge don’t include this information or provide this option, so you’ll need to be sure to leave your account access information available for your family members. If you have not prepared for the inevitable, please take a few minutes to do so. You can make the DNA arrangements now, and easily. Remember, at Ancestry, your DNA won’t be available unless your account (subscription and login) remains active, so you’ll need to take how to handle that into consideration. You might want to download not just your raw data files, but matches as well when possible. Upload your Y and mitochondrial DNA to sites like www.ysearch.org and www.mitosearch.org. Be sure to record the most distant ancestor and enough information to positively identify them, like birth and death dates, locations and spouse’s name. This is the only way to get your info into a public data base that is accessible without having DNA tested for a match. You can also enter Y and mito info at www.wikitree.com and attach it to the proper ancestor. This helps others in the future learn about their ancestors. Be sure to include your full haplogroup in the notes and a link to anything you may have published about that line. Upload your autosomal results to www.gedmatch.com and upload trees where possible. Don’t put all of your eggs in one basket, because baskets aren’t forever either. Think about how many genealogy companies have come and gone and what happened to our Y and mitochondrial DNA with both Ancestry and Sorenson (also destroyed by Ancesty). You can take a few minutes to put together a plan for how to preserve and present the balance of your genealogy information. Preserving and publishing my genealogy research has been on my bucket list for some time now and is the purpose of the 52 Ancestors articles I’ve been writing for the past 18 months. I’ll write them until every ancestor is covered….or I can no longer write the articles – and I sincerely hope I have the opportunity to finish. Not just for my own sake, but for the benefit of everyone else who follows. I hope future researchers make huge breakthroughs and add immensely to what I know today. My work will at least give them a firm foundation to start from and they won’t have to replow the same ground. One of the avenues to preserve your work online is a blog. WordPress offers free blogs and they will be available into perpetuity, whatever that really means. I am also printing my articles and will be donating them to archival facilities like the Allen County Public Library. And of course, I’ll have a set of binders for each of my children. WikiTree is another public resource for your trees, your Y and mtDNA results and additional information, although that’s not the same as offering the detail in an article. So, however you choose to do whatever you choose to do… just do it. You may not have an opportunity later. Time may be shorter than you think. Well, it’s not exactly a what-if question, it’s a given. You’re going to. The only real question is when, and will you be prepared? By prepared, I’m not talking about your will, I’m talking about your DNA. The unspeakable happened this past weekend. A long time researcher and close friend, Aleda, died, rather unexpectedly. She has been chronically ill for some time, but not critically. On Saturday, she read my blog, worked with her research group on the Autosomal DNA Segment Analyzer and ordered Emily’s book. Then, in the afternoon, she said she didn’t feel well and got into her chair to take a nap. Nothing unusual about that. Aleda didn’t feel well a lot, but she persevered anyway, always helping and guiding her research group. But this time was different. Aleda was gone. Her research group is wandering around like a group of lost souls. It’s like someone shot a hole through the middle of all of us. This isn’t a large well organized group with an official structure, but a small group of closely and not so closely related researchers trying to figure out their DNA and genealogy connections. If you are a significant contributor, you will be sorely missed. If you are reading this, and have had your DNA tested, you are one of the contributors. The research group members are already asking, “What next? How do we access the DNA records of the people Aleda had tested?” Good question. Let’s talk about preparing for the inevitable. Aleda had given the kit passwords to a friend, who is now so upset she can’t find them. As the project administrator of one of the projects that includes one of Aleda’s family member’s kits, I can see some of the information. I can see that Aleda set up a special DNA e-mail address which I’m presuming she used for all of the kits. Unfortunately, there is no alternate e-mail address. When Family Tree DNA, and virtually all the companies, do a password reset, they send the password information to the e-mail address on file. Does anyone, other than Aleda, have the password to that e-mail account? Project administrators cannot change primary e-mail addresses. Only the kit owner can do that. If you change your password to your e-mail account, you’ll need to remember to provide the new password to your trusted other as well. If you share your password with someone, that’s fine, but if they can’t find it, or if you change it and don’t tell them, that won’t be helpful. You might want to add their e-mail as an alternate. You might want to provide this information to multiple people, just in case your chosen person predeceases you, or some other unfortunate situation exists, like a fire, system crash or losing the passwords. At 23andMe, to download a raw data file, a password isn’t enough. You also have to know the answer to the secret question. Family Tree DNA goes one step further and provides people with a beneficiary form for situations just like this. Unfortunately, Aleda’s family member’s form is blank, and she protected his information by changing the setting to prevent project administrators from completing this form. Don’t forget about 3rd party sites like GedMatch where you may also be registered. 1. Family Tree DNA is the only company to provide the option of beneficiary information. Take advantage of this and complete the form. It’s only 3 lines – name, phone and e-mail of your beneficiary. You can find it under the “My Account” tab on the blue/black bar at the top of your personal page. 2. Add an alternate e-mail address. 3. Provide password and e-mail password information to a trusted other, and maybe a few trusted others. 4. Remember to notify password holders when you change passwords to either e-mail or DNA kits. 5. If you are a project administrator, try your best to find a co-administrator and share information, such as genealogy provided by participants. 6. 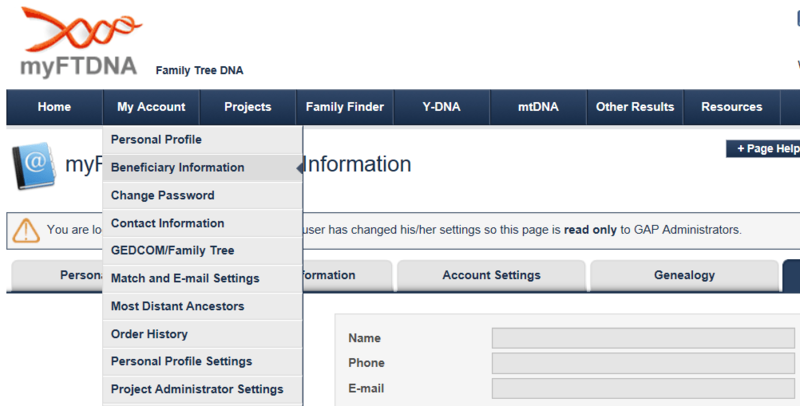 Provide a notification list for your family that includes important genealogy and DNA contacts, including Family Tree DNA if you are a project administrator. Many times I’ve received an e-mail from someone’s account with their name as the subject. I’ve learned to cringe when I see them, because I know what’s coming…but at least the family has taken the trouble to notify those of us who communicate electronically with that person instead of leaving us to wonder forever what happened. 7. Preparing for the inevitable doesn’t just apply to DNA testing, but to all aspects of online life. Think about Facebook, for example. My brother died 2 years ago, today, and no one has his password. We post to his page from time to time, but like a ghost ship, his Facebook account will sail off into the indefinite captainless future.